Social Media is pretty much everywhere you look these days. It’s hard to keep track of all the latest platforms. We use it for many different reasons from reconnecting with loved ones, meeting new people, to promoting our businesses or jobs. While some still do not see the need or benefits of social media more and more businesses are incorporating it, especially in the blogging world. If you are still wondering which accounts will work best for your brand and blog I am here to guide you in the right direction. Here are some my tips to take your brand or blog to the next level. By now you have heard me say this a lot, but it applies to so many diverse areas. Once you have done so proceed with choosing your favorites. With all the platforms being presented to you it is easy to feel like you must be part of them all. That’s totally not the case. My personal philosophy shows that I chose to be part of those that I not only feel comfortable with but will benefit my blog as well. I know it is easy to be discouraged when your followers are not coming as fast as you would like. We all have been there or still are. I will be honest, managing your social media takes patience. If you are presenting your best product. then eventually the right people will find you. Don’t compare your social media following. Sometimes, it is hard to do we are human after all. Instead, focus on achieving your own goals and ways you can improve. I know a big part of social media is having big numbers. Believe it or not, I have been extremely fortunate to receive amazing opportunities without having the biggest numbers as some of my fellow bloggers. They were drawn to my content instead. It doesn’t hurt to genuinely congratulate others as well. Who knows they might be there when it’s your turn. 5. Linkedin can be your friend. I know Linkedin is not always as popular as other social media platforms (i.e. Instagram, Snapchat or etc). However, don’t count it out because it is more business-oriented. Thanks to Linkedin I have connected with several fashion contacts. No matter which social media platform you use, choose your hashtags carefully. The following is the more personal approach. Depending on your post use targeted or popular hashtags. If you are working with a brand use the hashtags that are suggested. Be sure disclose if it is sponsored (i.e. #sponsored or #ad). Lastly, remember the rule of quality over quantity. The key is picking the right number of hashtags. 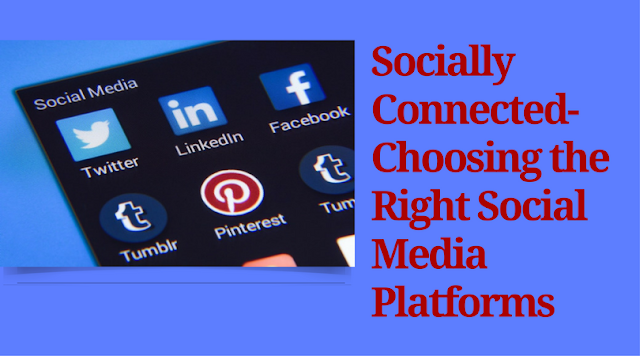 With this tips, you are on your way to selecting the right social media for you. Do you find these tips helpful? What is your favorite social media platform? Let us know in the comments below. Disclaimer-The tips and advice given in this blog post are based on my own blogging advice. Blogging experience and results may vary.